CAMARILLO, Calif., March 9, 2017 – Semtech Corporation (Nasdaq:SMTC), a leading supplier of analog and mixed-signal semiconductors, today announced it will demonstrate its comprehensive platform of optical IC products that support high-speed data transmission at the Optical Fiber Communication Conference and Exhibition (OFC) 2017 on March 19-23 at the Los Angeles Convention Center. Semtech’s Signal Integrity Products Group will highlight its ClearEdgeTM CDRs, single and multi-channel products, as well as integrated variants, for the datacenter and enterprise networking, passive optical network (PON) or Fiber to the X (FTTX), and wireless infrastructure markets. 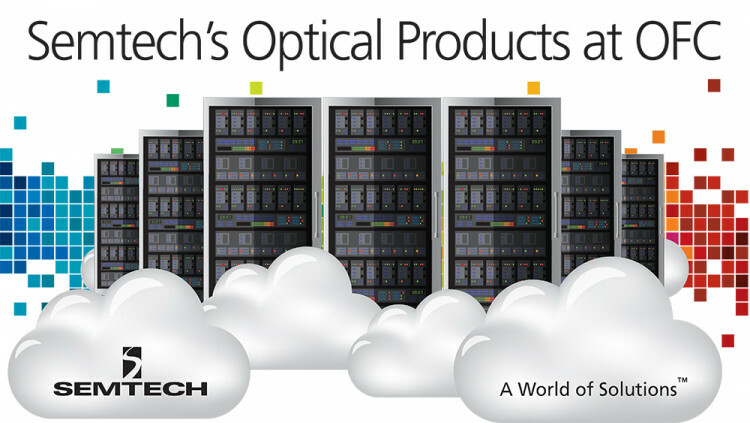 These new products add to Semtech’s optical IC portfolio ranging from 1 Gbps to 400 Gbps data rates for a broad field of end-user applications, such as cloud-based storage, FTTX communication, and mobile networks. Private product demonstrations will be hosted in a corporate village meeting space at booth 2575 by appointment. Email meetings@semtech.com to request a demonstration. All statements contained herein that are not statements of historical fact, including statements that use the words “will,” “plans to,” “introducing,” “to provide,” “designed to,” or other similar words or expressions, that describe Semtech Corporation’s or its management’s future plans, objectives or goals are “forward-looking statements” and are made pursuant to the Safe-Harbor provisions of the Private Securities Litigation Reform Act of 1995, as amended. Such forward-looking statements involve known and unknown risks, uncertainties and other factors that could cause the actual results of Semtech Corporation to be materially different from the historical results and/or from any future results or outcomes expressed or implied by such forward-looking statements. Such factors are further addressed in Semtech Corporation’s annual and quarterly reports, and in other documents or reports, filed with the Securities and Exchange Commission (www.sec.gov) including, without limitation, information under the captions “Management’s Discussion and Analysis of Financial Condition and Results of Operations” and “Risk Factors.” Semtech Corporation assumes no obligation to update any forward-looking statements in order to reflect events or circumstances that may arise after the date of this release, except as required by law. Semtech and the Semtech logo are registered trademarks or service marks, and ClearEdge is a trademark or service mark, of Semtech Corporation and/or its affiliates. Third-party trademarks or service marks mentioned herein are the property of their respective owners.